I had the great good fortune to attend Benjamin Wilson’s first off-piste (by which i mean non-sponsored) tutorial yesterday. The topic was “pornographic intarsia” which sounded hugely daring and exciting when I first read about it on Ben’s blog. 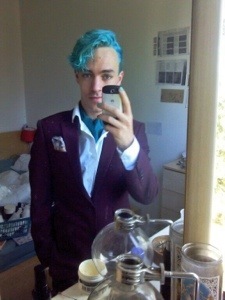 Ben is a character: I think, but I’m not sure (cos i didn’t ask) that he matched his contacts to his hair! A vision in turquoise. (pinched from his twitter feed). My friend and I escaped suburbia and walked along Oxford st towards soho. Things were quiet, morning after the gay pride day before, perhaps? The workshop was held upstairs in the Soho Theatre, and Ben sorted us out with a very civilised drink and course notes upon entering. My eyes immediately lit on the last item in the table of contents and before Ben had managed to get the words “explicit warning” out, I had already revealed an intarsia chart for an erect phallus. Brilliant. Fab charts aside, the real value of this workshop was learning how to make any photo into an intarsia chart using gimp. Well worth the fee for that alone, but the craic was great and I enjoyed myself hugely. 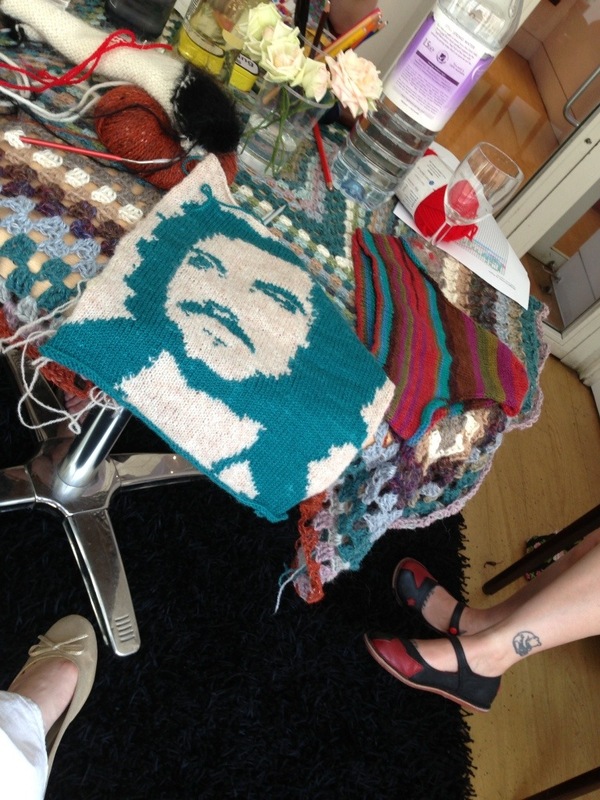 We also got to feel Ben’s knickers and see Ron Jeremy on a cushion cover. And I know it was an intarsia workshop, but I have to confess I didn’t do any… I like the bit of stranding I did though! Lovely colours. I’ll be keeping an eye on knityounexttuesday for future workshops. You should try one too. < Catchloops Update – And it’s also post #100! Lucky you! (On the genetics). Group good behaviour assured by excellent teaching. Oh, it was GRAND fun! 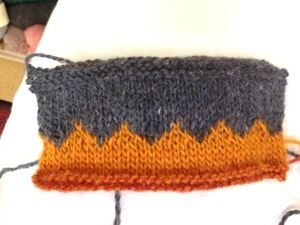 I think I want an orange and grey cowl now…. Me too! I’ve a jumper in mind first!